My mother-in-law is an OFW. She's a nurse in a very far away land and I know how hard it is for her to leave his one and only son (when he was just 3 years old) and that's my husband. If not for the welfare of her family, she will choose to stay here in our country. Because she only wants the best for her son, she decided to work abroad. It's been 27 years and my mother-in-law still works abroad. She go home once a year and if time permits, she will set her much needed vacation during holiday season. That's how our OFW relatives value their family and will feel so happy despite the sacrifices if they will celebrate Christmas with us. Christmas is the season of love and thanksgiving. The time most cherished by Filipinos, because more than the Noche Buena and the gift giving, we relish the precious moments spent with family and loved ones. “For our OFWs, the happiest time of the year is also sometimes the loneliest. I saw firsthand while I travel abroad how much Filipinos yearn for their home and families. There really is no place like home. For those who live in the Philippines, we are happy to give and receive gifts, but deep inside,there’s no greater joy than being with family. I’m proud to be part of a brand that supports, connects, and encourages the Filipino family to be together,” shares brand ambassador Piolo Pascual. The #CherryChristmas promo invites participants to share why they would like to have their loved ones home for Christmas. They can share their answers through a shortvideo, which will be uploaded through the #CherryChristmas app on the official Cherry Mobile Facebook page. The promo is open to all Filipino active Facebook users who have a family member working abroad. Cherry Mobile opens the doors and gives the opportunity for families to be together during the most special holiday season. 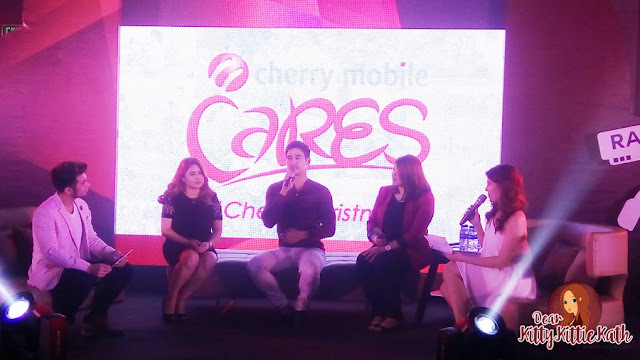 Cherry Mobile gives you more reason to be thankful. Happy holidays and cheers to a #CherryChristmas! Thank you so much Cherry Mobile for this gift to all the OFWs and their families. Invite your family and friends to join this promo. Good luck to all joining and have a Cherry Christmas, dearies! Cherry Mobile is now making its way to the top!